A spectacular and almost blindingly bright meteor sparked a flurry of emergency calls to the police after it lit up the skies over western Canada. Onlookers across the province of Alberta watched in awe, describing a kaleidoscope of colours as the rock rapidly descended. 'At first I thought it was fireworks,' farmer Marcel Gobeil said. And the police had no reason to doubt the claims. A video camera on one of their local patrol cars had captured the whole dramatic episode. 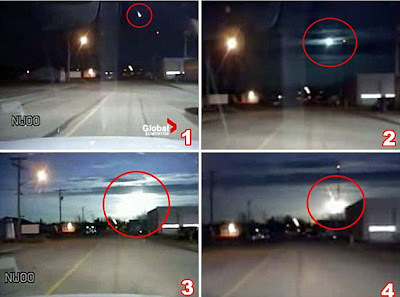 As the vehicle cruises down a street the footage shows a small bright light appearing in the sky before hurtling towards the Earth disappearing in an explosion of light just five seconds later. Shawn Mitchler was pumping petrol into his car in Radisson, when he saw the 10-second light show. 'My heart just started racing because I didn't know what it was,' he told The Windsor Star. 'It seemed like fireworks or a missile coming down,' he said. Astronomers will assess tapes and eyewitness reports to try and discover where the meteor fell, although Edmonton scientist Alister Ling said early analysis suggests central Alberta. Chris Herd, a professor from the University of Alberta said the descriptions suggested the meteor could in fact be a substantial meteorite weighing a few tonnes and measuring a few metres across. More meteorites, fragments of rocks or metals that survive the fall from space to Earth, have been found in Alberta than any other Canadian province. 'The question now that remains is whether anything made it to the ground,' Professor Herd said. Though one video viewer had his own hypothesis: 'Perhaps it was the toolbox dropped by the female astronaut recently?' he said.